The summary sheet for Shaltari has Voidgate armor listed as 5+/5" but it should be 5+/5+. Fixed it, files are updated. Great job, Abrusio!! Congrats. I find it most useful, specially the reminder of the turn sequence. The sheets contain a lot of useful information a nut shell. could you maybe also provide the source of the files? makes it easier to update. The files are generated from a database, there is no source file. What update did I miss ? Are there any plans to update these to include the newer ships like the UCM/PHR Centurion or any of the new Destroyers? I've just added the Remnant Cruisers and destroyers to the cards files. 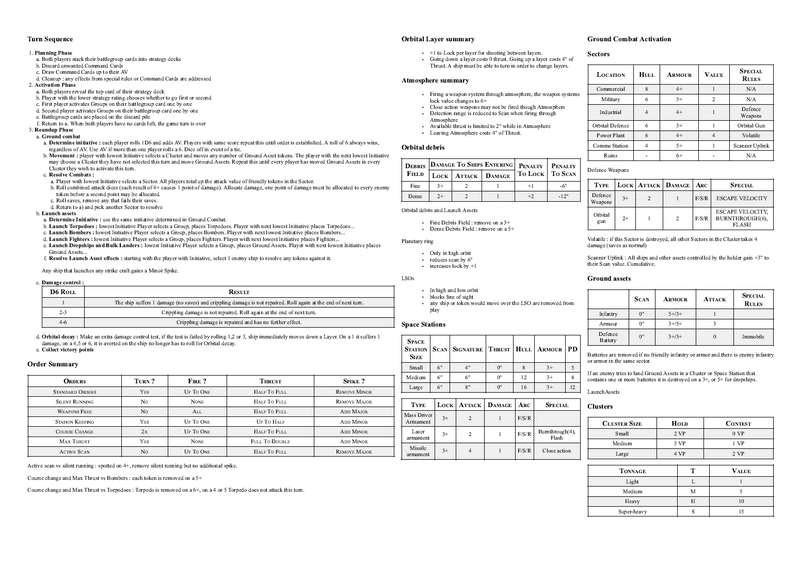 Unfortunately the summary sheets require more work. Can you please add the Destroyers to the Summary Sheets? Last edited by Intruder313 on Mon Aug 13, 2018 8:21 pm, edited 1 time in total.